The research focus on market uncertainty has been strong since the Great Recession. One of the key themes in finance over the last five years has been Risk-on/Risk-off (RO/RO) trading. There has been a strong focus on the VIXX index as an indicator of counter-cyclical market moves. It is only natural that there has been a deep focus on uncertainty by academic researchers over this period. 1. Macro and micro uncertainty increases during a recession. - The VIXX index of stock volatility will increase during a recession and will be negatively related to stock market declines. - The number of newspaper stories on uncertainty will increase in a recession usually because recession are preceded by large macro shocks. - The dispersion of macro-forecasts will increase during a recession. Forecasters do not do a good job of forecasting turning points in the economy. They only do well at extrapolating trends. - On the microeconomics side, there is an increase in dispersion of growth across industries during a recession. When the economy slows, marginal business will deviate from market leaders. - There is an increase in sales dispersion within industries. It is harder to do business in a recession and poorly managed firms will be more hurt more. - EM economies have more uncertainty based on divergence of forecasts and other macro measures. 2. Uncertainty leads to a delay in decisions. We can think of most business decisions as real options. If there is more uncertainty about a decision, it pays to delay or not exercise the option to act. 4. Risk premia go up when there is more uncertainty. Investors have to be compensated for the uncertainty they face. - Investors and businesses have ambiguity aversion. When it is hard to even make a forecast or provide good estimates of the extreme in a distribution, investors will avoid making any decision. Just hold cash. There are four reasons for EM risk premiums declining over the last few years and why they have now been rising even with the current improvement in EM equity markets. These are the factors that should be watched. 1. The China export/import engine - it created new demand for EM markets and was an offset to the US driver. 2. Low rates in developed countries - the low to negative real rates was a boom for EM markets. Real rates are higher in the developed markets and EM real rates have followed in the same direction. 3. Internal improvement - The budget and current account deficits have been controlled and domestic inflation has been much lower than historical numbers. The recent decline in the fragile five has changed the market view on internal economics. There is more focus on each countries as opposed to the EM in total. 4. 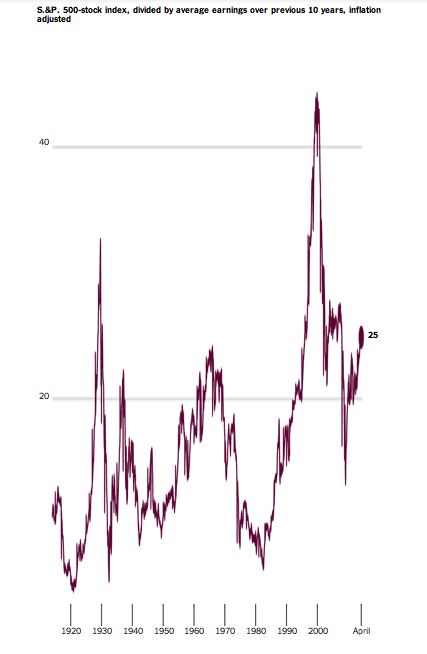 Commodity price surge -This was a great driver for EM equities. Since commodity prices have languished equities have followed. All of these have been in a state of reversal; consequently, EM risk premiums will continue to be tilted to the upside. The new buzz in monetary policy is Fed normalization. Of course, we still are trying to define it before we implement it. We need to go back to basics. For each of these conditions the answer is, NO for a Fed increase. It is not on the table. The real issue is with the comments from NYFed president Dudley. He stated that we may come off the zero interest rate bound before stopping the bond reinvestment programs. The Fed wants to raise rates in order the get some flexibility while still holding a large balance sheet. This suggests that we could see a rate increase sooner than expected earlier. It just means that rates could rise while the Fed holds its current huge balance sheet. This is something that the market should watch closer. Uncertainty has been one of the key research areas since the Great Recession. There are many who view that the high level of uncertainty has been holding back current economic growth.One of the more interesting pieces of research I have come across recently has been on the topic of good and bad uncertainty. See "Good and Bad Uncertainty: Macroeconomic and Financial Implications" by Gil Segal, Ivan Shaliastovich and Amir Yaron. We always think of uncertainty as a bad thing, but uncertainty can be decomposed into good and bad types base don the semivariance of consumption and production. Good uncertainty is technological innovation while bad uncertainty will be negative events like the Lehman failure. The first is good for economic growth while the second is clearly destructive. Both contribute to equity risk premium but have opposite signs for the market price of risk. There are a lot of assumptions and details with this paper, but the the key concept is important. Uncertainty is a priced risk, but it can have good effects not just bad ones. We should embrace good uncertainty and protect against bad. The hard part is telling which type of uncertainty we face. In most cases, this may seem obvious but even good uncertainty can be disruptive for some companies and therefore has priced risks. El Nino year - good for Midwest crops? We are in an El Nino year and that could be a good things for Midwest crops. The latest NOOA forecasts suggest that El Nino is 65% more likely this year which means wetter and cooler weather for the West and lower Midwest. The majority of the Upper Midwest will have warmer dry weather more likely in the Fall. This is good for crops and good for the areas that have been hit by drought. We have already seen a cooler and wetter Spring which has slowed plantings. Nevertheless, the weather swing may not be enough to have an appreciable effect on crops this year. Can investment managers learn from military failure? 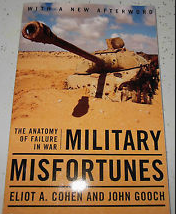 Read the book Military Misfortunes: The Anatomy of Failure in War by Eliot Cohen and John Gooch and walked away with the idea that their framework for looking at failures could be very useful for investment managers. This is not a new book but the ideas concerning failures are timeless. The comparison between war and investing is not far-fetched if you believe that what both face is a VUCA environment of volatility, uncertainty, complexity and ambiguity. Investment managers do not spend much time developing a culture of positive failure or one which is willing to discuss failure in the open in order to learn how to get better. Cohen and Gooch start with the premise that disaster theory from other parts of life can be applied to military thinking. There are different types of failure from simple to complex, but failure can be focused on three major themes, failure to adapt, failure to learn, and failure to anticipate. The size of a failure is compounded when these failures are aggregated. Aggregate failure on a number of levels can lead to catastrophic failure. The problem with analyzing failure is that most just do not want to do it. There is a politics of failure whereby we often want to attribute fault with an individual. There has to be someone who is responsible and can be blamed for why things go wrong. In investments, it is always the portfolio manager and not the organization that has been developed around the individual. Cohen and Grooch use a matrix for analyzing failure based on the command level versus critical tasks like communication of warnings, the appropriate level of alert, and coordination across groups. Looking at the investment world, it is easy to see that a performance failure can be placed in a failure matrix. If a large risk goes wrong, you should ask the question of whether the warning was actually given about the risks, the warning was given the right level of focus, and whether all interested group were provided the appropriate information. To do this type of review needs open communication and a deep discussion of policy and procedures. There can be a failure to learn because the critical tasks: resource allocation, coordination and communication, control and command, and doctrines and techniques are not focused in order to allow for learning to occur. You can have the right team in place but if the critical tasks are not undertaken you will not be able to learn from others to make a better organization. If learning does not go on, failure that could be avoided will occur. There can be a failure to anticipate. Here the critical tasks are: intelligence collection and reporting, the net assessment of the information given, and the appropriate alert once information is obtained. There will be surprises, but the issue is whether an organization is prepared for them once they occur. In the investment work, there can be surprise shocks to markets, the critical organizational concern is whether the firm is able to anticipate these shocks and then have a plan in place to react to this surprise. The Fed will surprise, but is there a plan in place to anticipate or at least be able to react to a surprise. If the answer is that something will never occur, there will be failure. There is also the failure to adapt where the critical tasks are: the resources for the means of adaptions, the identification of goals, and control or coordination of activities once adaptation is needed. In each of these cases, the command level will require different skills and response. for an investment organization the command structure can be traders, research portfolio managers and investment committees. each needs to respond to critical tasks. No failure has to be fatal, but if critical tasks from strategy, tactics, to underlying assumptions are not reviewed regularly, there is a greater chance for the compounding of failure which can lead to greater catastrophic failure. The responsibility of failure is not in the hands of an individual, although they can be a major contributing factor, but in the hand so of the organization that does not allow for learning, anticipation, or adaptation. 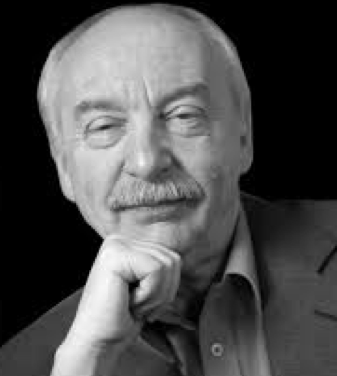 Gerd Gigerenzer is one of the most innovative thinkers in the world. I have had lunch with him and find him a very engaging fellow. His focus is on risk and decision-making, but his potential influence on thinking in finance, medicine, and everyday life can be profound. Everyone has to become more risk literate or as he puts it, risk savvy. It is not all about knowing statistics or complex measurement but being able to ask good questions and be good at counting. He shows in this book how to get more risk savvy, so that everyone can make better decision and live a little happier. This is a powerful book even with very little math and statistics. Being risk savvy is always asking for the right reference. what does a statistic refer to? It means understanding the difference between relative and absolute risk. The chance of some event increases by 100% could just mean that one extra person per thousand is affected. Being risk savvy can be as simple as understanding the difference between risks that are countable and uncertainty which may not be easily quantified. It is understanding the illusion of certainty and the uncertain with unexpected events. The classic case is with the turkey that is fed well every day until Thanksgiving. There was no risk until the day of reckoning. If you avoid being a turkey, reading this book is time well spent. Given the difficulties of measuring risk and dealing with uncertainty, there needs to be rules of thumb for dealing with uncertain events. Call it defensive decision-making. We have to accept that we have fears that can be unfounded; consequently, we have to work through our natural tendencies for avoiding risks that just do not exist. Everyone should take control of the risk they face from discussion of medical treatment to saving money. Risk is not something to be avoided but rather controlled through using good rules of thumb and learning to count occurrences through concepts like natural frequencies. Reviewing the macro indices from Newedge, now SocGen, tells an interesting tale about the differences in decision-making. You have one index which represents the best in discretionary decision-making with the best systematic managers. When we compare performance since 2000, the winner is systematic by a small margin. The systematic managers show more noise or volatility around performance, but the end results is that it has a smoother or more stable trend than discretionary managers who have had a very shallow slope for a number of years. The systematic managers may have less key man risk and more control over the risk within the portfolio. Everyone may have different preferences but having a rules-base system may let investors sleep better at night. 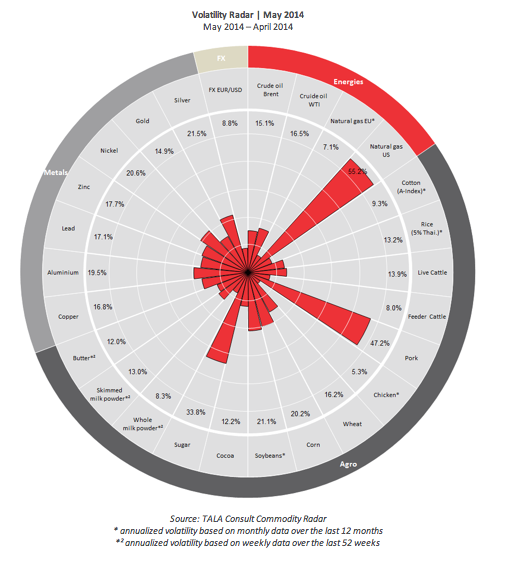 The guys at Talaconsult.com have done a great job at providing a nice simple dashboard showing current commodity volatility. This is a great use of design and highlights the differences in the current market. It shows that all of the commodity price action is still in natural gas. Regardless of the supply that has been added to the market, prices will move wildly with weather changes. Sugar and pork have been two active markets this month. The live hog market is subject to wild volatility given the inability to store inventory. There is a strong hog cycle, but short-term shocks to supply or demand cannot be smoothed easily without the ability to move product through time by having storage. Sugar has been on a wild ride due to weather in Brazil. The poor performance in the commodity markets over the last few years is hitting the underlying structure for how commodity business is being done. Futures trading may be the most visible part of commodity markets for investors, but the real activity is often behind the scenes with the big trading houses. It is this cash and logistic market where the money is made and where price is often determined. Here is where structure change is significant. Banks are getting out of the commodity business and firms are being sold. The shifts in demand from developed to emerging markets is changing firm and market dynamics. The points of supply are also changing which will require needs for capital equipment and infrastructure development. In the last few months, the structural changes have been significant. DB, UBS, and RBS is getting out of commodities. Morgan Stanley is getting out of the oil storage business and perhaps the cash business. Barclays is shrinking its business with the potential for a full exit. Goldman Sachs is selling its interest in metals warehouses. Mercuria is buying JP Morgan's physical business. Banks are getting out because there is a increase regulation, tighter capital constraints and lower profitability. The ABCD (ADM, Bunge, Cargill, and Louis Dreyfus) companies are in a competitive battle with the NOW (Noble, Olam, and Wilmar) companies. Many have different corporate strategies but there is going competitive overlap. These companies are in competition with Glencore, Trafigura, Mercuria, and Vitol, the other major trading houses. Glencore is a publicly listed company with strong mining operations through Xstrata and also bought Viterra of Canada it get access to more wheat trading. ADM tried to buy GrainCorp of Australia, but was rejected by the government. Marubeni of Japan acquired Gavilon to build infrastructure in the US. These larger trading house firms are increasing their grip on supply chains and they are active in the financing area. They both provide financing for resource companies and raising capital away from banks. These firms are also spending capital to move beyond just trading. They are also in the business of "form arbitrage", for example, changing oil into refined product, corn into ethanol. Commodity firms are also willing to take a greater role in logistical support through holding storage facilities and port operations. Smaller firms are being bought by larger firms. Governments are getting involved in trading. Noble is selling its agribusiness division to the Chinese state-owned trading company, Cofco Corp. Cofco also bough Nidera, the Dutch trading firm. This will place a government trading company in competition with the classic ABCD's of agriculture markets. The landscape will change but the real question is whether there will be more or less liquidity in the markets. Some will say this will be good for liquidity because these firms are more commodity focused. Others will take the other side of this argument. These firms are less likely to commit capital in areas that are not profitable. The jury is out for determining whether trade volume will increase. We just know that the players and motives will be different. Nothing in life is the be feared. It is only to be understood. Now is the time to understand more, so that we may fear less. Only a fool learns from his mistakes. The wise man learns from the mistakes of others. This is why research is so important. It can reduce our fears. I don't want to be a fool, so I study the works of others looking for what was done right as well as what was done wrong. It is hard but you have to keep research it simple and easy to explain and understand. A certain elementary training in statistical method is becoming as necessary for everyone living this wold of today as reading and writing. Need to have both - intuittion and a sense of numbers. “One should not look to the dot-plot, so to speak, as the primary way in which the committee wants to or is speaking about policies to the public at large,” Yellen said. 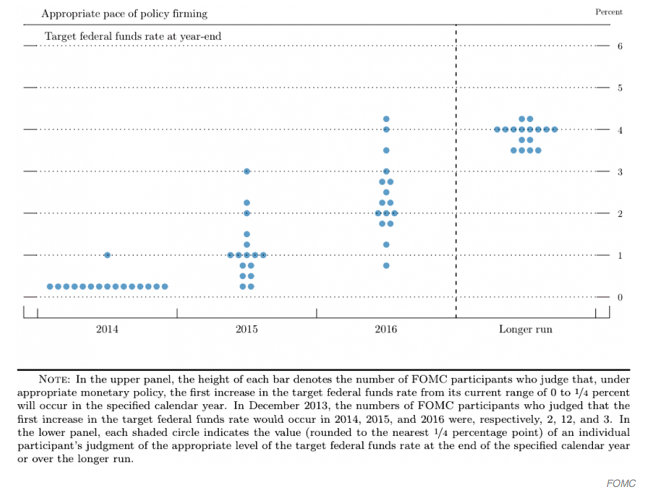 The Fed provides information on interest rate forecasts for FOMC members through dot-plot. You get an idea of the range of forecasts, but as members change there will be a change in the range of forecasts. This is not because interest rate views change but because the composition of FOMC members change. Warning, do not look at the dot-plot. So why do we have it and what does it tells us? Is there a correct way to view this graph? 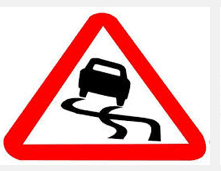 Finally, if a warning is necessary, is it really providing forward guidance? What does a commodity trading firm do? The Trafigura piece on the economics of the commodity trading firm by Craig Pirrong is now available to the general public and it is a good piece on the key roles that commodity trading firms provide for the market. So what do commodity trading firms do? They are actually very diverse but they all engage in the economics of transformation with respect to commodities. There are three major types of transformation, time, form, and space. The economics of time is through their willingness to provide storage facilities. They are paid to buy to today and sell later. This is critical with harvested commodities. They engage in the economics of space or logistics through facilitating the movement of commodities from one location to another. They also engage in the economics of form when they help the processing of a commodity into another form. This could corn into ethanol, soybeans into meal and oil, oil into refined products. Along with these services comes a myriad of other activities including hedging, insurance, and financing. They are not usually engaged in flat price speculative behavior but more focused on spreads and arbitrage through time, place, and form. 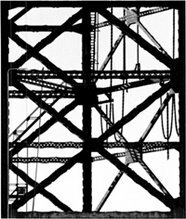 While it was written for Trafigura, Pirrong provides a unique piece on the economics of industrial organization of commodity firms that did not previously exist. If you want to understand and study commodity markets, this should be a critical piece of reading. 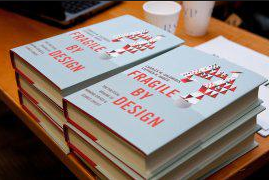 Fragile by Design - best economics book of 2014? Reading the new book Fragile by Design: The Political Origins of Banking Crises & Scarce Credit by Charles Calomiris and Stephen Haber gave me a completely new perspective on banking, credit markets, and why crises may occur. This could be the best economic book of the year as it explains why banking crises may occur because of the political structure of the country. This is not an indictment of the current regulatory environment or a story of the current crisis, but a history of how we may have gotten to this point through the cumulative choices and interaction between banks and government. The authors provide a rich history and examples of their underlying thesis that politics and banking go hand in hand. The state and banking are closely intertwined and the banking system we have is the result of politics. This is a much deeper story than any about rent-seeking or captured regulators. It is more about the link between authoritarian and democratic institutions and the ability of banks to have enforceable contracts. The rules of the game matter and whether the rules today will exist tomorrow when you lend money over time is critical with the type and amount of banking that exists. Democracies will lead to a different banking environment than a authoritarian regime. There has been a lot of talk about government regulation for banks, but little work has been done on providing context on the link between banks and government. This work fills the gap in ways that are not normally seen. The authors use case studies across countries and history to state their case. This work should open a new set of research on banking to prove their underlying hypotheses. Seldom will we see this type of work perhaps change the direct of though on banking, regulation, and crises. 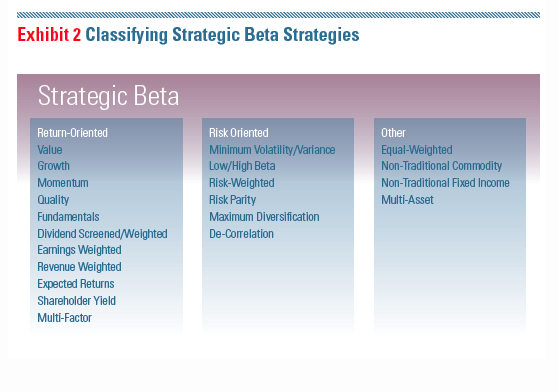 Morningstar has been pushing the concept of strategic beta. There are now so many definition on beta it is hard to get them all straight, but there have been some nice graphics to show the value-added from thinking through beta schemes. The key point is simple. Don't pay extra for beta that you can get cheap. 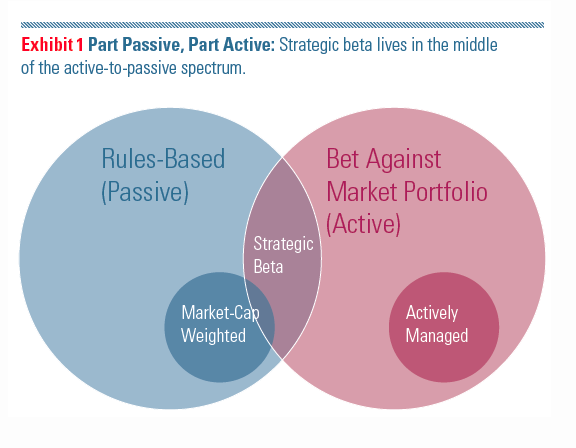 Strategic beta the portfolio combination of all the different beta choices. In the end porfolio managers have to determine the combinaton of betas in the porfolio. Do you wnat passive market-weighted or equal weighted? Do you want a Fama-French tilt? Do you want risk parity or a minimum variance portfolio? It is a different level of thinking about portfolio construction. 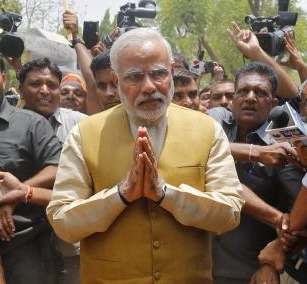 The Modi election to prime minister will awaken an emerging market giant. As one of the BRICS, India has been an important part of any emerging market story, but it has failed to deliver the same growth as China. It is currently plagued with low growth and high inflation. The landslide victory which may give the BJP party an outright majority may allow for economic reforms that increase growth. Many are calling this a pro-business victory, but it may be better to call it a pro-efficiency victory. This new government could lead to an end of corruption, government inefficiency, red-tape, and rent-seeking behavior that has damaged the potential for this large democracy. A high growth India is good for the poor and good for world trade. Elections shift investor sentiment. Let's hope there is follow-through. 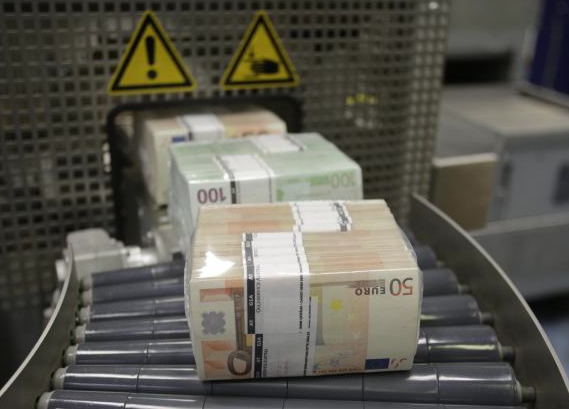 Th ECB is faced with an issue of how to get the EU into better financial shape. You can look at the sovereign risk premia which have all come down and say that Europe is fine. You can look at the improve in the equity markets and also make the case things are fine, but the fundamentals of the banking system and the economy may call for more policy action which means more quantitative easing or alternative policy choices. The key issue is the lean loan growth and the strong Euro which has the potential to choke exports. ECB president Draghi has been good at providing strong words concerning the direction of policy. His "do whatever it takes" speech of two years ago caused investors to take notice. He is currently signaling that more is likely to come from the ECB although he has not been as bold as two years ago. The Euro currency is a concern at 2 1/2 year highs. Low inflation and the potential deflation is also a real fear. We should expect a cut in rates with deposit rates going negative, but that may not be enough. The issue is how to go beyond the land of ZIRP (zero interest rate policy). As noted by Daghi, there may be a need for a "broad-based asset purchase program". That sound like a QE program to me. With EU money growth rate decelerating and suggesting potential for deflation, this seems likely. 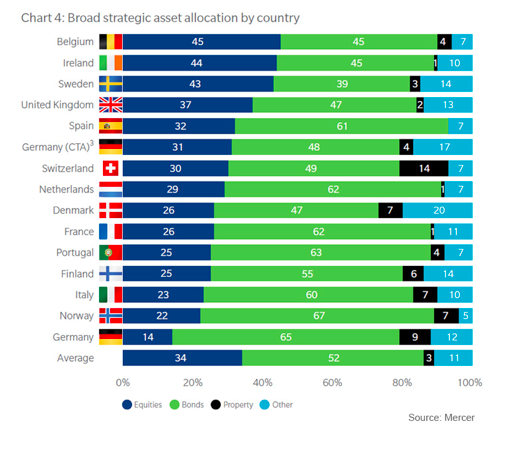 Mercer provided a breakdown of strategic asset allocation by country in their latest European survey of pension funds. These pension funds do not like equities with an average of only 34% versus bond allocations that are greater than 50%. There is no inflation in the EU and credit spreads have tightened but the absolute yield on bonds is low, so if you want to hit a targeted return of closer to 7-8% you are in trouble. Property allocations are small but outside of the major cities, there is little upside in real estate. The other category which includes alternative investments is going to generate mixed returns between stocks and bonds. Is this the allocation of the future or the past? Yellen notes that the tighter fiscal policy is creating a headwind which the Fed has to offset. Issue money with one hand and print money through buying debt with the other five years after the end of the recession. Action should be taken on labor markets but the current status quo will not get us there. There is no action to be taken even if debt is unsustainable so we will just move forward with adding debt and monetizing to a slightly lesser degree as we cut QE. Don't worry about inflation, the Fed has the tools to solve if it happens. Don't worry about bubbles, the Fed is looking at systemic risks. Don't worry about income inequity we caused by trying to form a wealth effect. We can tax the rich and savers and redistribute. Don't worry about forward guidance even though the Fed has a poor forecasting record and guidance is not the same as action. Don't worry about slow growth in the first quarter, we will make it up in the rest of the year. It was only weather. Don't worry about labor markets, our policies will kick in. The book Demographic Cliff by Harry Dent pushes the idea demographics as a headwinds to economic growth to an extreme, but it is a compelling case. It does a great job of explaining how demographics effects consumption and savings over generational cycles. If you want to understand why housing prices are rising at different times look at demographics. If you want to understand why some consumer goods are in demand look to demographics. Savings rates - demographics. Commodity prices - demographics. You may not get rich following this approach but there is a good link between demand, prices, and demographics which create a cyclical push in markets. 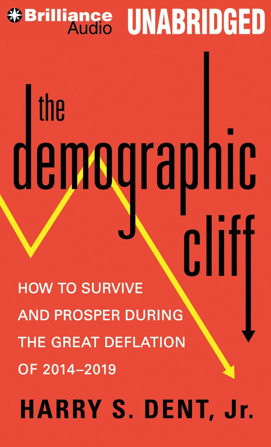 His conclusion is that demographics will lead to deflation cliffs and populations age and demand changes. It is a chilling tale that will change the world. Sometimes Dent takes these views to extremes, but it is worth discussing the implications of his thesis. There is not much truly new here, but his charts present the information is a very clear fashion. Governments should be preparing for the cliff; however, it is unlikely that they have read this book or they are just choosing to ignore the problem. Yellen on capitalism - Is this her real view? Sen. Bernie Sanders of Vermont, in a telling exchange with Yellen on Wednesday, wondered: "Are we still a capitalist democracy or have we gone over into an oligarchic form of society in which incredible economic and political power now rests with the billionaire class?" "I don't know what to call our system or how to — I prefer not to give labels; but there's no question that we've had a trend toward growing inequality and I personally find it (to be a) very worrisome (trend) that deserves the attention of policymakers." This is one amazing comment from the Fed chairman. There have been some recent books discussing the relationship between government and banking which explores the fact that the banking system could not effectively exist without a close association with government, but the views in the chairman's comments should cause everyone to sit up and take notice. What kind of economy do we have versus what kind should we have? Is more regulation going to make us more capitalist? Is less going to get us there? Or, do we need a more thoughtful view on what is the purpose and role of regulation? Certainly, using monetary policy to increase the profitability of banks as the key driver for higher growth is not going to generate the intended result. The central bank policy of trying to generate a wealth effect is not a direction for income equality or more competition. The idea of continuing an environment of "too big to fail" is not what should be expected from a capitalist eocnomy. This is an imporatn question with a non-answer which should leave all of us asking what is going on the economy and with government officials. I attended a CBOE seminar on VIX futures which had a strong bias of panelist from the managed futures industry. 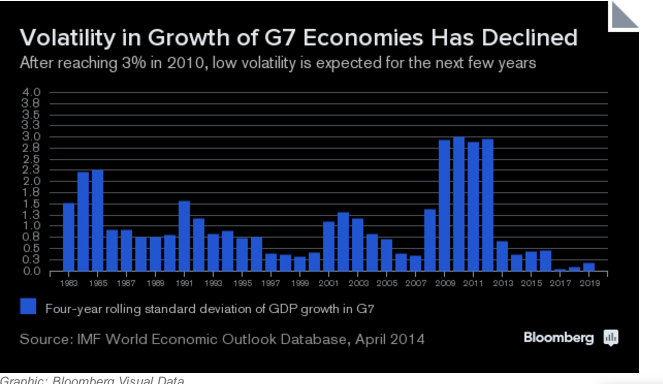 The talk is that volatility is low but it will be rising soon. This is also what we heard last year and the year before. The managed futures managers who are generally long volatility and divergent traders have seen poor performance because they have been waiting for the increase in volatility which just has not come. We have had some spikes in volatility since the Great Recession, but the trend as been the same, lower. The trade has been to sell VIX futures and ride down the steep contango curve. I am in the camp that volatility should increase, but it is not going to happen until an event occurs which drives the market to more uncertainty. We have not had that driver and those who are calling for more volatility do not have a story for why it will happen. Hence, there cannot be placed a timing on the event. Price based traders do not have forecast because they only react to prices, so the managed futures traders who look at only price trends will not find the evidence they need. They are living off of hope. I have that hope too, but you cannot trade that way and make money in the short-run. Saying the stock market will decline and volatility will increase may not be good enough. There has to be a reason for the decline. To get there, you must have a scenario of recession or policy failure. There has to be a catalyst and right now there is none that seems ready to move the market. There is more talk that we are in another period of economic moderation like the 1990's. A recent Bloomberg story sets the stage. The '90's were noted for its lower variability in GDP relative to other post-WWII periods which some are suggested is returning. The reason attributed for the first moderation was good monetary policy. It was the period of interest rate targeting. Economists suggested that 50% of the moderation was due to good policy and the rest just luck. 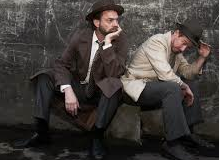 It was a time to celebrate Alan Greenspan and all knowing central banks. Of course, this was also the period of the Mexican debt and Asian debt crisis. While GDP variability has fallen, it is very hard to say this is associated with a new moderation or good policy. The low growth is more associated with stagnation. The variability around trend may still be high. Certainly, it may not be associated with good policy as the world frets about quantitative easing. QE got us to this point but it is not a stable policy to maintain a globla growth equilibrium. . The debt situation is much worse than the 1990's. The overall picture is that we are in a low risk premium and low volatility environment, but that should not be confused with a new Great Moderation. Gary Becker died last week and the economic world is worse off. I remember working through some of his essential papers on family and marriage.At the time, it was truly novel to have someone use principles of economics to look at these social issues. His application of economic concepts to problems of everyday expanded the scope and reach of economics. Most important, he made his students and readers think like economists. He will be missed. My daughter is taking driver's education and there was a discussion on the Smith system of defensive driving. After reading it, and remembering that I learned this too many years ago, I realized that this process also makes sense for money management. The crazy thoughts that will come into the head of an economist. Here are the rules of the Smith system in a short-form. Makes sense to look into the futures. Of course, a manager needs to a a sense of the big picture. Don’t stare. (Use your peripheral vision). (Stop the fixed habit stare). Keep your eyes moving by look at all of the alternatives. Good advice. Monitor the space cushion around you and your bike. You have to have an exit strategy for any investment. Use your signals- (Directionals, 4-Way Flashers, Head Lights, Brake Lights, Horn, Hand Signals) Make Eye Contact. Having a healthy dialogues with the investments made through management contact or just thorough review is very helpful. Manage defensively your assets through the old Smith system. Short-term trading is best done in a long-term account. Why? the impact of taxes. Recent discussions with some high net worth investors suggest that active trading should be placed in tax sheltered accounts or there should be an implicit increase in return to offset the fact that taxes will be higher. The cost of making more decisions is that the government will take more. More return is needed versus any buy and hold strategy. All hedge funds should have a tax efficiency rating. Managers should be expected to beat a long-term index play by at least the marginal tax difference, and more should be done to focus on what accounts should have active trading. Alternative investments should be in tax protected accounts. When is copper not copper? China has had an almost insatiable demand for copper, but a lot of it was not going into construction but held as inventories for "shadow" loan collateral. When the metal is used as loan collateral, copper is no longer copper. It becomes a financial asset which reflects credit conditions in China. China consumes about 40% of all global copper production, but the demand is also associated with its use as a collateral for loans, or as the process is described by some, "buy, store, hedge, and pledge". 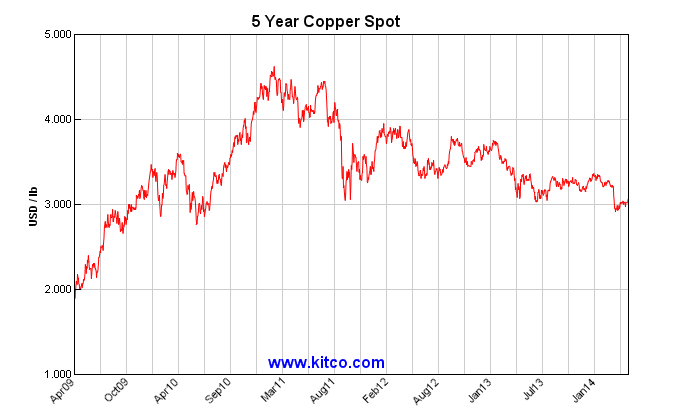 The copper price will change with the demand for loans. If credit is restricted through normal channels, the copper avenue will be the mechanism for new funds. Some have argued that one third to one half of all copper inventories has been tied to loan arrangements. If bank funds are tight, the copper serves as the physical collateral for loans especially in the construction market. Copper has been used especially as collateral for 180-day letters of credit. If the price of the copper collateral falls, more will have to be posted for loans. Similarly, if there is a tightening of shadow bank regulation, copper will be sold because it cannot be used for these arrangements. There will be a negative feedback loop in the market. The government passed regulation to stop this process last year, so this new environment all places down ward pressure on copper. 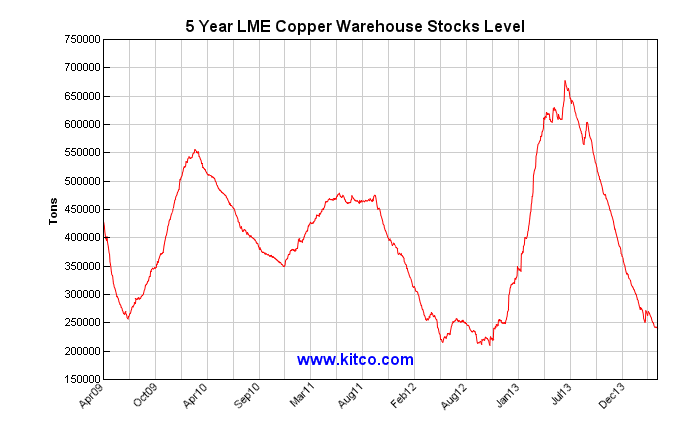 Other base metals are higher on the year because the financial aspect of copper is weighing down the price. The NY Times had another article on bubbles and equity markets. This has become a recurring theme in any discussion of equities these days. Is there truth to this view? The data suggests that we are at elevated levels of valuation and when that happens forward returns usually end in the lower tail of the distribution. There may not be a crash but you should not live off of gains that will never occur. Valuations can go higher in a low rate environment but the margin of safety is much lower than what was seen just two or three years ago. Mexico is not a commodity-based economy like Chile and Brazil. Mexico is more closely related to trade with the US. 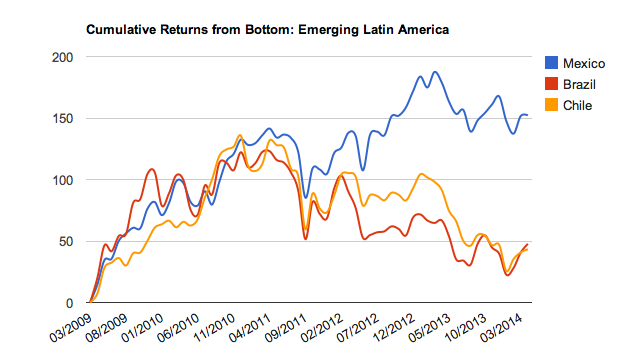 The US wealth pull is taking Mexico away from other Latin American equity markets. Turkey is having ups and downs in ways not seen in Russia and South Africa which are both more dependent on commodity trade. Russia is going to continue to be a laggard given the troubles in the Ukraine. Between internal issues and sitting on the crossroads between Russia, the EU and the Middle East, Turkey will see continued volatility. Thailand as a trade center is the only Asian market which has set itself apart from India and China which have not shown equity strength. 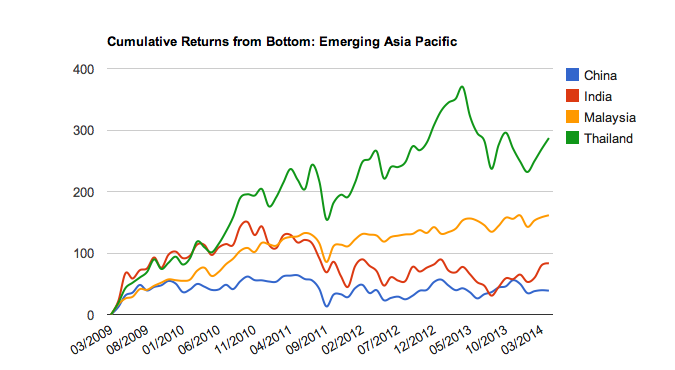 The big story of BRIC's has not translated into large wealth gains in the post-crisis period. 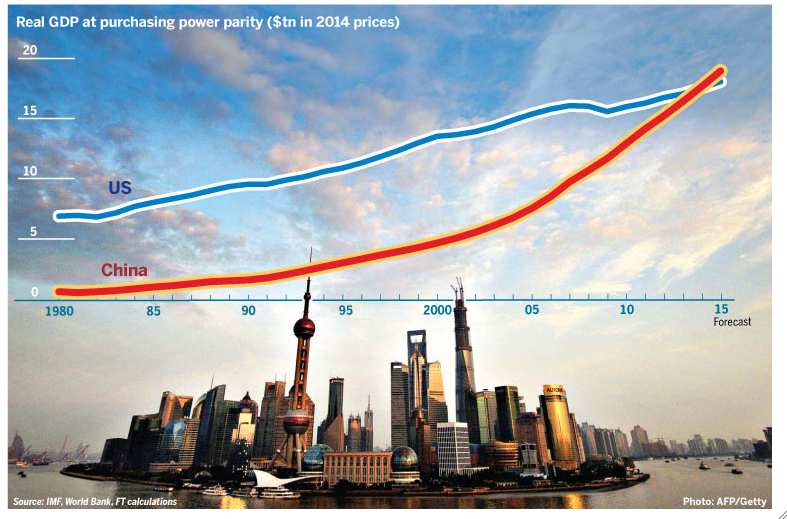 China surpassing US - should we care? The news that made headlines and shocked some is that the Chinese economy has surpassed the US on a purchasing power basis. This is not something that the Chinese really wanted to happen, but for the first time since the late 1800's, the US is not the world's biggest economy. Is this going to have a meaningful change in world views? This was expected to occur for so . me time. Now it is a reality. The US has higher per capita income and more wealth, but economic power has shifted significantly. This headlines is, however, not news. It does tell us that we have to be aware of the economic goings-on in China. We cannot think of commodity markets without having a view on China. This has been the case for years, but this news just reinforces this thinking. 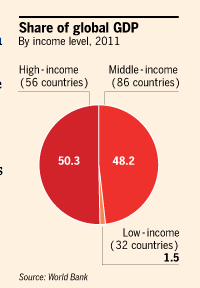 The high income economies represent only 50% of global GDP. 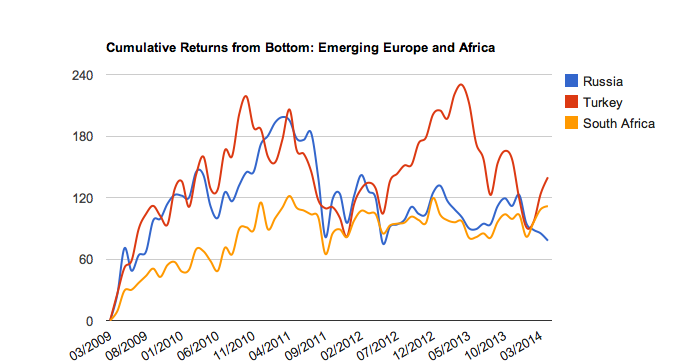 The emerging markets are going to take up more of our attention, period.